J. Koßmann, T. Hammerschmidt, S. Maisel, S. Müller, R. Drautz. 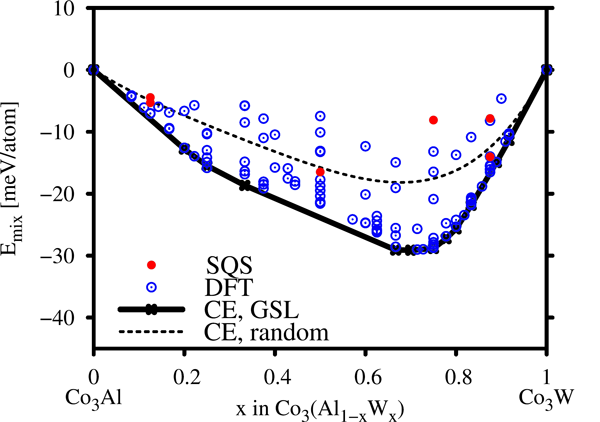 Energy of mixing (in eV/atom) of Al and W on the Al-sublattice of Co3(Al/W) as obtained from density-functional theory calculations. The disorder is treated by special quasi-random structures (SQS) and a cluster expansion (CE) showing the ground-state line (GSL) and the random alloy. Co–Al–W-based alloys are promising new materials for high-temperature applications. They owe their high-temperature strength to hardening by ternary L12-Co3(Al1−xWx) precipitates, which may form even though binary Co3Al is not stable. In the current work, density functional theory calculations are performed to study the solubility and ordering of the transition metals W, Mo, Ti, and Ta at the Al sublattice in L12-Co3Al. The sublattice disorder is modelled with a newly parametrised cluster expansion and compared to results using special quasi-random structures. Our results for W and Mo show that the mixing energy exhibits a minimum at approximately x = 0.7. However, the computed small values of the mixing energies indicate that W and Mo atoms are fully disordered with the Al atoms already at low temperatures. For Ti and Ta we find no sizeable driving force for ordering with the Al atoms. The computed solubilities on the Al sublattice obtained are in the range of 40–80 meV/atom for W and Mo and less than 25 meV/atom for Ti and Ta.